A custom vacation home designed to accommodate two families. Inspired by the rustic mountain lodges from the early 20th century, the interior spaces are organized around the Great Room, a vast two story space defined by exposed heavy timber framing and a suspended bridge that leads to the master bedroom suite. An ashlar stone fireplace anchors the Great Room at one end, while the other end opens to a gourmet kitchen that marries a traditional aesthetic with a contemporary sensibility to form and function. 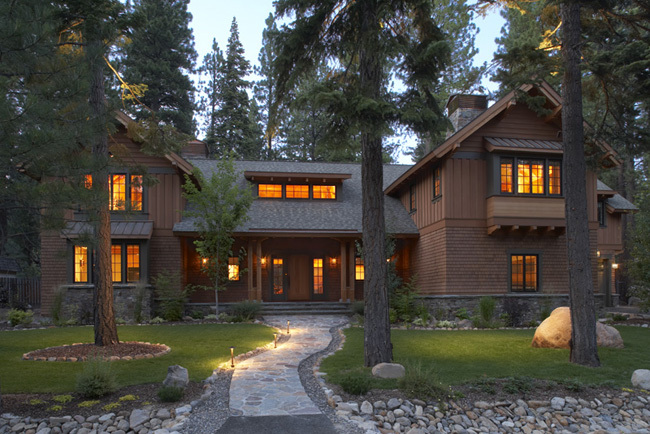 Outwardly, the home's craftsman character combines natural materials with meticulous detailing. The considerable mass of the structure is integrated into the surrounding environment with a studied devotion to proportion, poise, and balance.